TO GO TO THE DXA HOME PAGE, CLICK HERE. DXA is an innovative website that allows DXers to view the QSO log and the status and activities of the DXpedition in near-real-time. Within a few minutes after making a contact with the DXpedition, the DXer is able to see confirmation of that contact. Information such as the callsigns logged in the last minute and in the last hour, and the bandmodes currently being worked by the DXpedition, are displayed in a simple, automatically-updated interface. The entire application runs within a standard browser--no software needs to be downloaded or installed. The image below is a screenshot of a simulation of the DXA interface as it will appear for the TX5K operation. The map shows the most recently logged callsigns at the approximate latitude-longitude according to public database information. When we log a QSO with you, we will illuminate a green square ("greenie") in your personalized table for the appropriate bandmode, confirming your entry in the log. Note that once you see the green square, there is no need for an insurance contact. Also, you can be absolutely certain that you have not worked a pirate. Important note: Logging into the DXA window DOES NOT enter you in the TX5K radio log. You must make your TX5K QSOs on the air; DXA merely confirms that these QSOs are in the TX5K radio log. You can see a working version of DXA by clicking on the image above. If you wish, you can log in with your callsign (lower left corner), and see whether you are in the (simulated) TX5K log. It is not necessary to log in to see the activity of the DXpedition, but you must log in order to see your own personal bandmode table for logged contacts (the lower left table in the screenshot above). 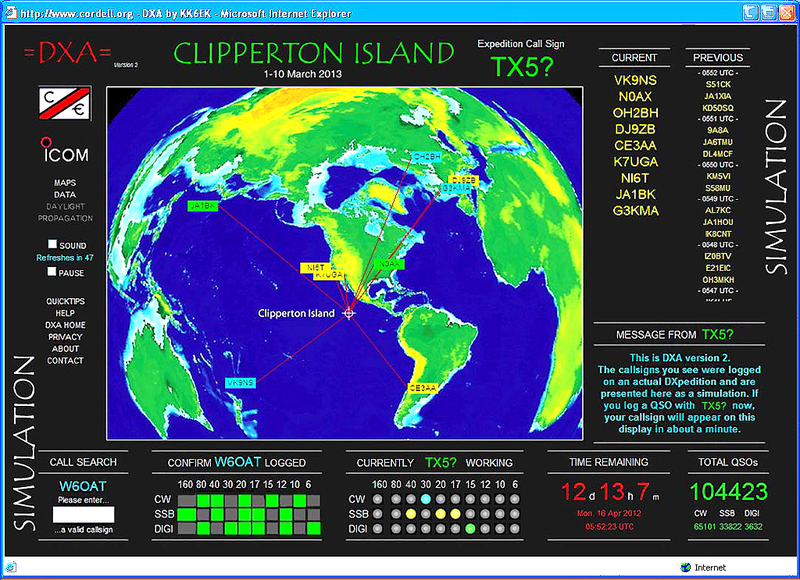 This operating DXA window is for demonstration purposes only--the actual Clipperton log will be started when the DXpedition becomes active (March 2013). At that time, all the personal bandmode tables will be empty, and as you make QSOs, your personal table will fill with green squares...provided you actually make the QSOs, of course!